For the second consecutive night the Bruins blew a two-goal lead and ended up losing, tonight in regulation against the Islanders. The 4-2 loss went from a 2-0 lead to a 3-2 deficit in exactly six minutes from the second period to the third period. The Bruins are now riding a four-game losing streak, the last two of which are highly concerning. The Bruins allowed 41 shots on goal tonight and couldn’t keep up with New York’s speedy forwards Michael Grabner and Matt Moulson who both scored goals. The Bruins would get a bit of fortune from the referees early in the game when the Islanders were called for a late hit on an icing call. The referees didn’t indicate icing until very late, until it was too late for a check to be avoided. The Bruins wouldn’t jump on the early chance, extending their goalless streak on the power-play to 20 chances. The two would play some sleepy-eyed 5-on-5 play with neither team really challenging the opposing goaltender or really setting up in the offensive zone. The Islanders would get the game’s second power-play. The Islanders would pressure the Bruins heavily during the power-play, especially towards the end when Tim Thomas made a standing pad save then went to his back in his crease while the Isles fired away, somehow the puck stayed out of the net before the referee prematurely blew the whistle. The Bruins, fresh off surviving the penalty, would get the next power-play when Kyle Okposo was called for a suspect boarding penalty on Milan Lucic. The Bruins power-play continued to struggle as it appeared that Claude Julien was tinkering with power-play combinations, going deeper down the lineup and finding nothing. The Bruins would score a few shifts later when Nathan Horton won a puck with his skate in the slot and fisted a backhander past Al Montoya as he was falling. The play started with Adam McQuaid pinching in and carrying the puck across the zone, creating havoc for New York’s defense. Eventually, David Krejci ended up with the puck in the corner. He fed to Lucic but Lucic couldn’t put a Grade A opportunity together as he was being faced up by a defender. Nathan Horton then crept in from his position in the high slot just as a puck squirted out front, he used his leverage to win the puck with his skate and then put a backhander past Horton as he fell to the ice. The Bruins would do some scrambling in their own zone in the final minute but pulled it together well enough to take a 1-0 lead to the first intermission. The Islanders would get their best chance so far when they broke out a 2-on-1. Johnny Boychuk cut down the lane by going to his stomach and Thomas came well off the goal line to cut down the shot angle, stopping it under his pad before spinning under the goal line and getting the whistle. The two teams would then play some largely boring 5-on-5 hockey, with neither team getting any real good scoring bids like they did in the first period. Milan Jurcina would go to the box for holding a little after the middle point of the period, giving the Bruins their third power-play of the game. Michael Grabner had the best chance during the first half of the power-play when the Islanders forced a turnover. Grabner was led in space but couldn’t get full control of the puck and Thomas came out to make the save. Right after, Frans Nielsen, who caused the turnover, would go to the box for cross-checking, giving the Bruins a 5-on-3 for just under a minute. The Bruins would break their power-play drought when Zdeno Chara blasted a one-timer from across the zone past Montoya. Krejci made a nice saucer pass through the triangle to Chara on the opposite point. Chara then fired a low shot past Montoya as Montoya went right to left. The Isles would start to fight back with some good scoring chances but the Bruins blocked a lot of those shots down and managed to keep the two-goal lead despite increased pressure. Late in the period, Brad Marchand would go to the box, giving the Isles a chance to cut the lead in half going into the final frame. Matt Moulson would score with two seconds left in the second period when the Bruins failed to clear their zone. John Tavares shoveled a pass between his legs to an uncovered Moulson to Thomas’ left. Thomas couldn’t track the puck behind his net and swing around to the post in time to stop Moulson’s bid. The Isles would carryover a ton of momentum and erase a two-goal deficit in less than two minutes of game time when Michael Grabner beat the Bruins to a loose puck and then spun and shot the puck under Thomas for the equalizer. The Islanders finished off a pressuring shift when a shot was kicked aside by Thomas but put into no man’s land. The Bruins defense couldn’t get the puck in their skates and it slid to Grabner who quickly spun to the forehand and put a shot on net. Thomas couldn’t get set in time and the puck went in under him. The Islanders would then score a few minutes later, their third unanswered goal, when a Jack Hillen shot from the point deflected off of Dennis Seidenberg and past Thomas for the third goal in six minutes. Hillen’s shot appeared to be going wide but Seidenberg was directly to the left of Thomas, preventing Thomas from getting to the shot and then being in the position where the shot bounced off his upper body and in. With just under seven minutes left, Nathan Horton let his frustration boil over, taking a stupid penalty away from the puck when he threw a check on Hillen for no good reason. A power-play goal would give the Isles the dagger and even if they didn’t score it would be two minutes off the clock. The Bruins would kill it off and returned to 5-on-5 play with less than fie minutes left in the third. 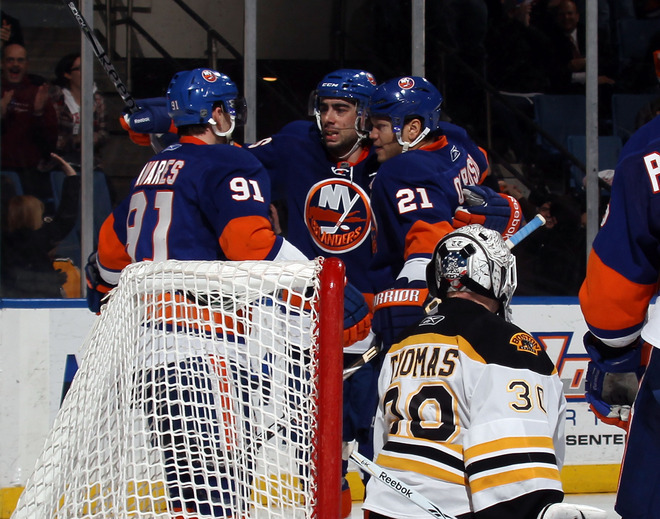 The Isles kept up solid pressure in the waning minutes, keeping Thomas in his net until there were 68 seconds left. The Bruins had trouble getting in the New York zone with their goalie pulled, and when they did they couldn’t get anything done. Patrice Bergeron was forced to hook down P.A. Parenteau on what would have been an empty-net breakaway and Parenteau was awarded the goal. The Bruins will have three days off before the play the Blue Jackets in Columbus.